Bernard started his career in the youth set ups at Birmingham City and then Aston Villa, earning his first professional contract with Aston Villa in 1953 leaving them in 1955 without making a senior appearance. He moved to Chester City (1955-57) but due to competition for places and a knee injury he only made 21 league appearances and scored four goals. He moved to Altrincham (1957) and then Witton Albion (1957-58) as an amateur when he scored 14 goals. Signed for Macclesfield in 1958 but was only used on four occasions (September and December), finishing up on the losing side for all four matches. On leaving Macclesfield he played for Lockheed Leamington (1958-59), Halesown Town (1959-60) and Cradley Town (1960). The son of the former England international ‘keeper of the same name, Jack was an amateur with Blackburn Rovers before moving to Accrington Stanley in September 1945, where his father was manager. He moved to Stockport County in November 1946 and signed for the Silkmen in July 1950. His style was in complete contrast to his father’s workmanlike approach, performing in a flamboyant and eye-catching way with acrobatic penalty saves his specialty. He was regularly in the starting line-up, was Player of the Year in the 1950-51 season, won a Cheshire Senior Cup winners’ medal on three occasions and was in the side which won the Cheshire League Championship in 1953. Jack's one goal came in the final league match of the 1952-53 season when the team had already won the championship - he walked the length of the pitch successfully converting a penalty, normally the role of Jimmy Richardson. He moved to Nelson in July 1955 and was a woodworker by trade. A local player, who was first signed as a sixteen-year-old, made five appearances towards the end of the 1937-38 season, however, in the 1938-39 season he appeared regularly at right-back. He also played in Macclesfield's 1939-40 war-time team before serving as an Aircraftsman First Class during the Second World War. Following a tour in the Middle East, he returned home at the end of the war when he played for Northwich Victoria. On his return to the Moss Rose in 1949 he moved from Congleton Town and played fairly often throughout the 1949-50 season, with his one goal coming in the 2-4 defeat at Winsford in November 1949. A native of Newcastle-under-Lyme progressed through the youth team at Newcastle Town. He moved to Kidsgrove Athletic netting 11 goals in the 1998-99 campaign before re-joining Newcastle Town. Vauxhall Motors paid Newcastle Town a fee around £2300 for him in January 2001. Signed for Macclesfield from Vauxhall Motors for fee of £35,000 in March 2003 having made a great impression during their amazing FA Cup run the previous season and having scored 14 goals in their 2002-03 season. Most of his appearances for the Silkmen came when other players were either injured or suspended, usually as a central defender where he made good use of his aerial ability, but occasionally came on from the substitutes’ bench as a striker. Unable to settle to league football to the degree he would have liked, Matt moved to non-League Leek Town in February 2004 but a car crash ended his time at Leek in 2005. He was out of semi-professional football for 2005-06 and as it has been reported that he played for Sunday league Club Blue Mugg where he was regularly on the score sheet, it may well be it was at this time he played for the club as part of his rehabilitation. Having recovered he signed for Newcastle Town in 2006 and then Staffordshire County Senior side Redgate Clayton. Matt signed for Congleton Town at the start of the 2007-08 season but moved to the semi-professional Spanish club Horadada in June 2008 moving back to Congleton Town at some time in the 2008-09 season. During his two seasons with Congleton he netted on 50 league goals in 68 appearances. He re-signed for Kidsgrove Rovers for the 2009-10 moving back to Congleton Town in July 2010 but quickly returned to Kidsgrove Athletic until the end of the 2010-11 season. He then re-signed for Leek Town at the start of the 2011-12 season but during his second season he requested a transfer spending from March 2013 to the end of the season on loan at Norton United. Returned for the fourth time to Kidsgrove Athletic for the 2013-14 season and then Alsager Town for the 2014-15 season. Subsequently played for Kidsgrove Reserves but must have continued his registration with Alsager Town as he made an appearance for them against Bootle on 26 March 2006. Since the start of the 2016-17 season Matt has been playing in Division One (2nd tier) of the Staffordshire County Senior league for OSSMA (Ormiston Sir Stanley Matthews Academy) Blurton TTFC (formerly Tunstall Town). Jordan started his career at Stockport County making one appearance for them before moving to Macclesfield in the summer of 2005. In his first season he was a regular in the Youth team scoring five goals and, in recognition of some fine performances, was given his first professional contract in the summer of 2006. He featured regularly for the senior side in the 2006-07 season playing with passion and determination in the centre of midfield, scoring his first senior goal in the match at Hartlepool in February 2007. With few opportunities for Jordan at the Moss Rose he moved to MK Dons on loan in November 2007 with former Silkmen manager Paul Ince, where he remained for the rest of the season. On his return to the Silkmen in the summer of 2008, he was an unknown quantity to manager Keith Alexander and consequently only featured occasionally. He spent a month on loan at Altrincham and on his return enjoyed a 10-match continuous run, but was released in the summer of 2009. Initially he signed for Ashton United and then Kettering Town and in August 2011 for Radcliffe Borough. He returned to Ashton United in September 2012 and later played for Northwich Victoria (December 2013) and Trafford FC (2015-16). A 17 year old who had taken part in pre-season matches who was given a couple of opportunities to deputise for regular members of the team. Although a Scotsman by birth, Will commenced his career in 1998 at Oldham Athletic in their youth section gaining his first professional contract there in August 2001, going on to make 180 appearances in all competitions. In the summer of 2007 he moved to Scottish club St Mirren appearing almost 60 times in two seasons. He then moved south of the border in the summer of 2009 signing for Morecambe where he remained for four seasons making over 130 appearances. Whilst there he spent time on loan at Fleetwood for the second half of the 2011-12 season. Will spent the 2013-14 season at Hyde before signing for Macclesfield in August 2014. At Macclesfield Will played in a defensive midfield position appearing regularly in September and early October but then injury severely restricted his appearances, although he returned towards the end of the season and picked up a winners' medal in the Cheshire Senior Cup competition. Signed for Ashton United in the summer of 2015 and was subsequently appointed joint manager leaving in May 2017. In 2018 it was established that Will had retired from football and was working in car sales. 22-year-old son of Manchester City secretary Bernard, he had made his mark at both Stockport County and Bury before signing for the Silkmen. However, after only one match he moved to Australia. Started his career with Healey Parish (Rochdale Sunday School League) and then signed for Bacup Borough (August 1921), Rochdale All Saints (May 1923), Accrington Stanley Reserves (July 1923), Rochdale (August 1924), Connah's Quay (May 1928), Reading (June 1930), Rhyl Athletic (July 1931), Charlton Athletic (May 1932), Barrow (July 1934), Hyde United (July 1935) and Mossley (August 1936). Signed for Macclesfield in the summer of 1937 when he featured in the senior side for early season matches but then played for the reserves before moving to Newton Heath Athletic for the 1938-39 season. A Macclesfield Grammar School Old Boy, Vic scored a brace of goals on his debut but only made three more appearances in the 1905-06 season. The majority of his appearances came in the 1906-07 and 1907-08 seasons when he was almost ever present playing in the defence, although his first three matches for the club were at centre-forward. Vic was described as a speedy, fearless, clever and skilful player who was popular with the supporters. He moved to play for the Northern Nomads in 1908 but also signed amateur forms for Macclesfield, making a single appearance in each of the 1908-09 and 1909-10 seasons. Whilst playing for the Northern Nomads against Macclesfield at the Moss Rose in the semi-final of the Cheshire Senior Cup in the 1910-11 season, some of the Macclesfield supporters shouted insulting remarks at Hall throughout the match because they were annoyed that he was playing for the Nomads, even though he was an established Nomads player and only made the occasional appearance for the Silkmen. Due to the actions of these supporters, he never played again for Macclesfield. In addition, his father who was the President of Macclesfield Town Football Club, resigned his position. A tall forward he had been on the books of Tranmere Rovers prior to signing for Macclesfield. From his debut until the end of the 1914-15 season he was virtually ever-present with his 11 league goals in the 1913-14 season helping the Silkmen to achieve promotion from the Second to the First Division of the Lancashire Combination. There is no information recorded about this player and no evidence has been found to link him with the 'G Hall' who played for Macclesfield from 1913 to 1915, however, it would appear that he was one of many players given a trial in the 1919-20 season. He then played for the senior side during the 1921-22 season when most of his appearances came in November and December 1921 at outside-left when he replaced Charles Hughes and before Ben Boardman was signed. His single goal was scored in the 1-2 defeat at Winsford on 12 November 1921. Signed from Southern League side Portsmouth in the summer of 1914, he only appeared in the first three matches of the season scoring his one goal in the 5-1 victory at Nelson. John first played for Macclesfield during the pre-league days, initially as a forward during the 1883-84 season and then as a defender but moved back to the forward line for the 1888-89 season where he proved to be success appearing regularly on the score sheet and was season top-scorer in 1890-91 and 1891-92. In October 1890 he scored all four goals in the 4-1 home win against Leek, and in December of the same year he notched up a hat-trick in the 4-4 draw against Burton Swifts. Even towards the end of his career he continued his scoring exploits with a hat-trick in December 1894 in the 6-1 home win against Hurst Ramblers. John was captain for the 1887-88 and 1888-89 seasons and won Cheshire Senior Cup medals in the 1890-91 and 1893-94 seasons. He retired from football in April 1896. Signed from local club Parkway Clayton, Peter scored a hat-trick in the 7-2 win over Caernarfon Town but failed to win a regular place in the senior side due to strong competition from Steve Burr and Bob Askey. He went on to play for Nantwich Town, where he was the leading scorer in 1989-90 with 25 goals, then Newcastle Town in the summer of 1991 before returning to Nantwich in October 1991. Also played for Rists United, Eastwood Hanley, Burton Albion, Rocester, Shepshed, Wednesfield and Kidsgrove Rovers. Had a spell as manager at Meir KA in the 2001-02 season. After coaching Port Vale's under-16 team for over three years, was appointed assistant coach at Nantwich Town in early 2005 taking over as head coach in July 2009 but was released from his duties in March 2010 . Born in Macclesfield, he started his football career with Macclesfield St George's before signing for Macclesfield FC, first appearing in March 1893 and was the preferred right-half throughout the remainder of his time at Macclesfield. Tommy gained a winners' medal in the Cheshire Senior Cup competition in 1894. He moved to Stockport County in the summer of 1896, Glossop North End in 1900 returning to County in October 1902, remaining there until December 1907 when he returned to Macclesfield. He featured in three mid-season matches at a time when an experiment was being undertaken with positional changes including Warham, a defender, moving to the forward line. According to the census records of the time he was a concreter in the construction industry. Tom died in Stockport in April 1955 at the age of 78. There is no information recorded for this player who was probably being given a one match trial. Commenced his career at Manchester United before moving to Stockport but did not make a senior appearance for either club. He then moved into the non-League scene at Irlam Town and went on to play for 17 other clubs throughout his playing career, most notably on two occasions at Buxton where he notched up 198 appearances. Micky's sole appearance for the Silkmen came when he was on loan from Winsford United deputising for full-back George Shepherd. He eventually became manager at Curzon Ashton for an unknown length of time. Came through the youth ranks at Stockport County signing his first professional contract in 2009. Has played over 100 Leagues One and Two, Conference and Cup matches for County who released him at the end of the 2012-13 season. Signed for Macclesfield in August 2013. For much of the season Andy was the first choice right back including playing in every match in the excellent FA Cup run which only ended following a replay at Sheffield Wednesday in the third round. In the 2014-15 season Andy was again the first choice right back making some impressive performances, but with 13 cautions and one red card to his name he missed six matches through suspension. Represented the England C team against Turkey, Estonia and Cyprus and gained a winners' medal in the Cheshire Senior Cup. During the 2015-16 season Andy was again the first choice right back, missing very few matches and standing in at centre back on occasions. Represented England C against Ukraine as a late substitute. Appointed team captain for the 2016-17 season and again featured regularly right back only missing a few matches during the whole the season including a three match ban and time out following an injury. Andy achieved three milestones during the season - made his 150th appearance in all competitions for Macclesfield in the away league match at Maidstone on 29 October 2016, scored his first ever goal for Macclesfield in the 3-2 win at Chester on 21 March 2017, and had the privilege of leading his team out at Wembley for the Buildbase FA Trophy Final. Out of contract at Macclesfield Andy signed for Chester in the summer of 2017 but having been released signed for Guiseley in the summer of 2018. A regular member of Macclesfield's reserve side, he was promoted to the senior side in the middle of March until the end of the season at a time when the side were involved in two cup competitions. He featured in all three Cheshire Challenge Cup ties scoring a goal in the first round and was a member of the losing final team. Phil was scouted by Macclesfield whilst at Alsager College in 1977. He only played three games due to travel problems as he had moved back to the family home in Sheffield. Phil then played for Retford Town in the Midland League, teaching PE on a part-time basis which allowed him to turn out for Chesterfield reserves mid-week matches who were at that time managed by Billy Dearden. In 1978 obtained a full-time teaching role in Finchley which meant that he had to give up any ambitions of playing football due to work commitments. Moved to Cornwall in 1994, again taking up a teaching post from which he retired in 2012. In 2016 was still playing league cricket for his village team. Prior to joining Macclesfield Hallworth was playing in the North Staffordshire League as an amateur. He made an immediate impact on his debut scoring both goals in the 2-0 home victory against Hooley Hill. During the latter part of the 1911-12 season he established himself and from November 1912 was the first choice outside-right. On leaving Macclesfield he played for Great Harwood (1913-14), Hurst (1914-19, 28 appearances and three goals), Stockport County (1919-20, 2 Appearances) and Barrow. Previously on the books of Wigan, Halsall only played in the first three matches of the season, the centre-forward position being filled by Tom Case and then A Lawton. Gordon was brought in mid-season from Northwich Victoria for a fee of £300 as a replacement for John Collins having previously played for Leek Town. He was released at the end of the 1975-76 season. Rotherham born Matt, signed a one-year deal at the Moss Rose in July 2010 after a successful pre-season. He represented England at schoolboy and under-18 level and started his career as a trainee at Sheffield Wednesday. He made his senior debut in August 2000 going on to make 88 appearances in all competitions scoring six goals. When Sheffield Wednesday were promoted from League One Matt was released. He moved to Stockport County in the summer of 2005 where he was made captain and made 44 appearances. Another move followed, this time to Mansfield Town where he made 96 appearances, but left when they were relegated to the Conference. Matt then signed for Notts County making 70 appearances and was part of the League Two title winning side, but was released in the summer of 2010 when he made the move to the Moss Rose. Although not always a first choice in the starting line-up in the 2010-11 season, However when Matt played he was an influential player in the centre of midfield using the ball intelligently, passing accurately with the ability to change the game when introduced from the substitutes’ bench. The 2011-12 season saw Matt feature in the majority of matches using his excellent work rate to good effect. Released in the summer of 2012 at the end of his contract, Matt signed for Matlock Town in September 2012 but moved to Stocksbridge Park Steels in October 2012. Is Development Phase lead coach at Rotherham United overseeing the 12 to 16 year old players and coaches youngsters at Thomas Rotherham College. Played for Sheffield United and then Chester City before signing for the Silkmen from Runcorn. Dave was a regular member of the reserve side. By professional he was a school teacher. Many years later he worked for the club in the IT Centre and subsequently as Community Manager when he brought many youngsters to match days. He went on to work for A-Line, former kit suppliers to the club. As a schoolboy Mitch was recruited into Birmingham City’s youth system at the age of eight and at the age of 15 played in Birmingham’s reserve side. On leaving school he began a two-year scholarship with Birmingham City in July 2010 signing his first professional contract in May 2012. From 2012 to 2015 he made 40 appearances in all competitions for the Championship side. He spent three months on loan at Crawley Town during the 2015-16 season making 16 appearances and scoring two goals. On his return to Birmingham he made no further first team appearances and was released on the expiry of his contract in the summer of 2016. In the 2017-18 season all of Mitch's appearances came on the left wing but there were times when he was not first choice, however when Ryan Lloyd was injured at the end of January 2018 Mitch was ever-present to the end of the season, his performances helping the Silkmen to become Champions of the Vanarama National League for the 2017-18 season. Scored seven goals including a hat-trick in the 4-1 victory at FC Halifax Town on New Year's Day. Although offered terms for the 2018-19 season with Macclesfield Town Mitch elected to leave the Moss Rose signing for MK Dons in June 2018. Previously on the books of Manchester United and Chorlton Athletic, he only made two appearances for the Silkmen: in the 2-1 win on his debut and in the following match a week later, in the 1-2 defeat to Congleton Town in the Cheshire Senior Cup. Signed late in the 1946-47 season from Bolton, Charlie made five consecutive appearances scoring in the wins against Ashton United and Droylsden. In the following season he could not establish himself as a regular in the side, probably because 11 different players were used for the inside-right position throughout the season. He scored again against Droylsden in the 7-2 home victory at the end of December 1947. Made his name with Manchester United and had also played for Rhyl. A right sided player who featured in the first seven matches of the season but only played occasionally after with his contract cancelled in December 1955 at a time when the club were experiencing financial difficulties. Another player who gave excellent service to the club over many years. Steve was an exciting and skilful midfield player who was a regular in the side for eight seasons. Born in Chester and a postman there, he signed from Oswestry previously having enjoyed league experience with Crewe Alexandra, in addition to non-League experience at Nantwich he also spent time in Finland with Ekenas. Steve was a member of the successful Silkmen 1986-87 Northern Premier League Championship side when he also gained winners' medals in the League and Presidents Cups and played at Wembley in the 1989 FA Trophy Final against Telford United. Also gained Cheshire Senior Cup winners' medals in 1991 and 1992. Whilst with Macclesfield earned a semi-pro cap for England in March 1990 against Wales. On leaving Macclesfield he returned to his home city taking up a backroom role at Chester City FC. First appeared in the Hallefield side (Hallefield moved to the Moss Rose when Macclesfield FC had failed financially) making four appearances in the Stockport and District League team which won the Championship without being defeated throughout the season. Remained with Hallefield when the team moved to the North Staffordshire and District League appearing fairly regularly. It would seem that he left at the end of the 1898-99 season returning to the re-formed Macclesfield FC's Manchester and District League team for the 1902-03 season with the majority of his appearances coming in the 1903-04 season. One of six different 'keepers used in an indifferent season for the Silkmen, Hardman played in the final six matches of the season when he conceded 14 goals. A big, consistent central defender, Mick was initially signed on loan from Altrincham with his move made permanent in 1985. He had previous non-League experience with Warrington Town, Runcorn and South Liverpool. Mike played his part in the treble winning side in the 1986-87 season when the team won the NPL Championship and he gained winners' medals in the League Cup and Presidents Cup. Mike moved to Droylsden in August 1990 and then to Warrington before returning to Macclesfield to help out for the 1992-93 season. Having retired from football Mike is now a self-employed builder. A left-sided midfielder signed from Oldham on a one year contract, Lee was unable to force his way into the senior side on a regular basis, although when used he provided pace and made some telling crosses into the box. He was released in the summer of 2003 and went on to play for Hucknall and Leigh Genesis before moving to Scotland where he played for Ayr, St Johnstone and Hamilton. Des played for Ellesmere Port Town before signing for Tranmere Rovers in 1946. He remained there until 1954 making a total of 150 league appearances scoring 17 goals before moving to Stafford Rangers. He stayed at the Moss Rose for almost two seasons and could consider himself unfortunate to be released in March 1958 at a time when it was necessary to reduce the wage bill. There is nothing recorded about this player who made two appearances, his debut and in the match at Mossley on 23 September 1929. Originally with Manchester City with their under 18 team before moving to Blackburn Rovers and then the Nike Academy. He then signed for Wolverhampton Wanderers Under 21 side. One of 11 players signed on non-contract terms for Macclesfield Town at the end of October 2016 prior to the Cheshire Senior Cup Preliminary Round in which he made his sole appearance for the club from the substitutes' bench. Released in November 2016. Signed for Central FC in May 2017 but was released in June 2017 after which he signed for Patro Eisden but was released in Mar 2018. Jack commenced his career at Nantwich where he played centre-forward. During his time there he was selected for the Cheshire Amateurs team, captained the County team in 1929 and also played in an FA team match at Manchester. When he moved to Chester he successfully made the transition to full-back. Signed for Macclesfield from Altrincham and was ever-present for the Silkmen, using his stamina, pace and skill to the full, until forced out by an injury in March 1934 when George Stockton replaced him. On leaving Macclesfield he played for Hyde and then Manchester North End, returning to the Macclesfield in September 1938 only making two senior appearances throughout the 1938-39 season. In addition to playing football, he was an accomplished rugby player and in his spare time enjoyed playing bowls. Prior to joining Macclesfield he was a member of Manchester City Reserves. In the 1946-47 season Jimmy was the established right-back but lost his place when William Bardsley was signed. In the 1947-48 season he became a member of the reserve side when he appeared five times for the senior side.. Signed from Eastwood (Hanley) where he had already scored 18 goals in the season for the West Midlands side, but could not add to his tally whilst at the Moss Rose. Returned to Eastwood and joined Nantwich Town in July 1981 but left the club in November 1981 after only netting one goal in nine Cheshire League starts. A member of the Macclesfield reserve team he made one early season league appearance and one further senior appearance in the Subsidiary Competition in April 1920 when the club had to play two fixtures on the same day. Having been on the books of Stoke City and Cardiff, Harrison was a member of the reserve team at Macclesfield making just one senior appearance. Before moving to Macclesfield in the summer of 1962, Peter played for Leeds United, Bournemouth, Reading and Southport. He only spent a single season at the Moss Rose before moving to Runcorn and was later youth and reserve team coach at Cardiff City. He was a charge hand at a steelworks before retiring following a heart attack. Having played for Scunthorpe United, Halifax Town and Northampton Town, Paul moved to Macclesfield in February 2004. Throughout his time with the Silkmen he featured regularly, and in the 2004-05 season was ever-present. Paul usually played on the right side of midfield, but his versatility allowed him to play just as effectively in any of the midfield positions and when required seamlessly moved into the right wing-back position. A speedy player, who never gave less than 100%, Paul was voted Player of the Year in 2004-05. Having been released in the summer of 2006 Paul moved to Port Vale and in the summer of 2008 to Chesterfield. On leaving Chesterfield, Paul played for North Ferriby for a time before taking up a position as Centre of Excellence co-ordinator at Scunthorpe United in January 2011. In August 2015 became a member of staff in the Birmingham City Academy and in October 2016 was appointed Senior Professional Development Coach at Barnsley with responsibility for the Under 23 side. In February 2018, on the departure of manager Paul Heckingbottom to take up the managerial role at Leeds United, was appointed caretaker manager pending the appointment of a new manager. Paul moved to Manchester City in June 2018 where he was appointed Head of the Elite Development Squad taking over from former Macclesfield player Simon Davies. Barry had a wealth of league experience before his move to Macclesfield. His career started at Watford (1956-60), after which he moved to Sheffield United for a fee of £3,000 (1960-66) were he made 101 league appearances scoring 16 goals, and then to Carlisle United for a fee of £14,000 (1966-67). He had also played for Stockport County (1967-70), Oldham Athletic (1970-71) and Southport (1971-72). Signed for Macclesfield Town in the summer of 1972 he was a versatile member of the team playing in a number of positions during his time at the Moss Rose. 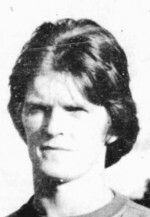 He gained a Cheshire Senior Cup winners' medal in 1973 and was voted Player of the Year for the 1972-73 season. On leaving Macclesfield he moved to Buxton (1974-75), before signing for Witton Albion (1975-76) and finally Hyde United (1976-77). Wilf began his football career at Runcorn in the 1919-20 season and then moved to Bradford Park Avenue where he made his Football League debut in September 1920, scoring on his debut and making one further appearance. Unable to secure a first team place at Bradford he moved to Accrington Stanley for the 1921-22 season as their senior team's left-winger, however, he suffered injury problems, including a sprained thigh muscle, which resulted in him only featuring in 14 league games and a single appearance in a Lancashire Senior Cup match. He was given a two match trial at Macclesfield in March 1923 but was not signed. He moved to Middlewich during the 1923-24 season. There is no information recorded for this player who appeared towards the end of the first season of the newly formed Macclesfield FC in their pre-league days. Before signing for Macclesfield Jack was on the books of Short Heath United FC and Stoke City signing for Macclesfield as a 22 year old in the summer of 1934. A sound and capable defender who was the team's penalty taker. He was almost ever-present in the 1934-35 season but missed a couple of months in the first half of the 1935-36 season following surgery. Frank was a member of the side which won the Cheshire Senior Cup in 1934-35. On leaving Macclesfield he signed for Football League club Lincoln City in August 1936 where he made 100 appearances in all competitions before moving back into non-league football with Grantham in the summer of 1946 and Boston United in the summer of 1948. Note: Whilst he clearly played at left-back during his time at Macclesfield it would appear that he was a recognised right-back with other clubs. Died in Stoke-on-Trent in 1971. David, a 19-year-old defender, had been on trial at Stoke City before being taken on trial at the Moss Rose on a match-by-match basis. He lasted just the one match as it was felt that he was no better than defenders already in the squad. This decision left some of the supporters believing that David had not been given a fair chance. Neil joined the Silkmen in the summer of 2008 at the age of 24 from Retford where he scored 76 goals in 134 appearances, 34 of his goals coming in the 2007-08 season helping the team to the Unibond Division One South Championship. Although born in London, Neil has represented Barbados at full international level, including World Cup Qualifiers. He made his Football League debut in his first appearance for the Silkmen, but with other strikers establishing themselves in the senior side, he only made five further appearances from the substitutes’ bench. However, he spent time back at his old club, Retford, where he scored 11 goals in 13 appearances. Neil was released at the end of the 2008-09 season when he returned to Retford but could not replicate his previous scoring form. He then played for Marine (summer 2010), Hednesford Town (summer 2012), re-joined Marine (March 2014), Witton Albion (summer 2014), Cefn Driuds (2015), AFC Telford United (2015). He signed for Runcorn Town in 2016 but left without playing a game signing for Widnes FC remaining there until November 2016 when he joined Conwy Borough in the Huws Gray Alliance. 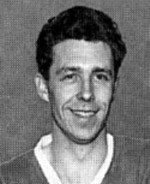 Dennis was signed from Buxton in September 1957 having previously played for Rochdale and Altrincham where he was the 1955-56 season top-scorer with 25 goals. His one gaol for the Silkmen came in the 1-2 home defeat against Rhyl. 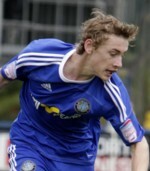 A member of Macclesfield's reserve team whose five senior appearances were spread throughout the season. His one goal was scored in the 3-2 win at Middleton on5 October 1901. Signed in the summer of 1902 to fill the outside-right position appearing regularly until the middle of February 1903. His last match for the club appears to have been the round three Cheshire Senior Cup tie against Sale Holmfield when he scored Macclesfield's only goal in the 1-2 defeat. There is no information recorded about this player, however, he was Macclesfield's goalkeeper from the start of the 1901-02 season until the middle of December 1901 when Tom Lloyd took over the goalkeeping duties. Started his career with Sudden Villa before signing for Rochdale in September 1919. Signed from Blackburn Rovers where he was their top scorer in the 1919-20 season and scored a hat-trick (his second in successive games) in the final match of the season in the 4-0 win which saved Blackburn from relegation. In the first half of the 1925-26 season at Macclesfield Hawksworth filled forward positions but moved to left-half for much of the second half of the season, although there were still matches when he returned to the forward line. On one such occasion in January 1926, in the match at Manchester North End he scored a hat-trick but found himself on the losing side. He also became the team's penalty taker and was appointed captain at the beginning of January 1926 leading the side in the final of the Cheshire League Challenge Cup in which Macclesfield finished as runners-up. On leaving Macclesfield he signed for New Brighton in October 1926 retiring at the end of the 1926-27 season when he was appointed coach at Bury. Died in his home town of Rochdale on 7 July 1961. A well-travelled player who was part of the Blackburn Rovers youth system from 2004 to 2008, signing his first professional contract with Rovers in the summer of 2008. He made just one substitute appearances for the senior team but spent time on loan at Gateshead (2009) and Rochdale (2010). He signed for Bury in the summer of 2010 going on to make 52 appearances in all competitions scoring three goals, although during his time at Bury he spent time on loan at Oxford United (2011) and Bradford City (2012). A move north of the border in the summer of 2012 saw Andy join Falkirk on a free transfer and two year deal, however, he failed to settle in Scotland and after his contract had been cancelled by mutual agreement he signed for Rochdale in January 2013. Having only made seven appearances at Rochdale he signed for Notts County in the summer of 2013 but found himself on loan at Tamworth in December 2013 for whom he signed permanently after one appearance. Joined Cheltenham Town in the summer of 2014 but as he was unable to force his way into the first team on a regular basis went on loan to Barrow in January 2015 signing for them permanently in the summer of 2015. At Barrow he made 53 appearances in all competitions including 20 from the substitutes’ bench. With his contract at Barrow cancelled by mutual agreement, signed for Macclesfield on 3 February until the end of the 2016-17 season. There were few opportunities for Andy with just two league appearances and six occasions when he was an unused substitute. Signed non-contract forms with Torquay United in August 2017, moving to Guiseley on a permanent basis at the beginning of October 2017 and having been released by them at the end of the 2017-18 season signed for Glossop North End in July 2018, but in August it was reported that he had signed for Halesowen Town, however, later in August he moved back to Glossop North End. Yet another move came towards the end of September 2018 when he signed for Bamber Bridge followed by a move to Stafford Rangers at the beginning of November 2018.. Initially with Glossop before signing for Southampton Reserves (November 1935) he then went on to play for Manchester North End (August 1936) and Rochdale (August 1937). Signed for Macclesfield in the summer of 1938 he was the regular left-half until November 1938 when Syd Rosson took over the role, resulting in Haworth only making occasional appearances from then until the end of the season. He deputised for Frank McDonough in goal on two occasions: the first in the 0-4 defeat at Witton Albion in December 1938 when McDonough arrived late for the match having missed a train connection, and the second in the 0-7 defeat at Hyde United in February 1939 when McDonough had incurred a hand injury. On leaving Macclesfield he returned to Rochdale in August 1939. Billy's career started in the youth section at Buxton before moving to Manchester City in 1959 where he remained for one season. He signed for Crewe Alexandra in 1960 going on to make 142 league appearances and scored 30 goals playing as a winger. 1964-65 saw him at Grimsby Town leaving them for Stockport in 1965 where he established himself as a regular in the side making 261 league appearances in six years. He left in 1971 to spend a short time with Port Elizabeth in South Africa returning to England finishing the 1971-72 season at Southport. Appointed manager at Macclesfield for the start of the 1972-73 season, he began rebuilding the team and led them to a marathon Cheshire Senior Cup final victory against Winsford United which was achieved after three replays. After a mediocre first half of the 1973-74 season Billy resigned in January 1974. Whilst he was described as a 'player/manager' he does not appear to have made any appearances for the senior side. Moved from Barrow where he never made a senior appearance, but only featured in two senior matches in March 1950 and later played in the reserve team. A member of the Macclesfield reserve team for several years, the majority of his appearances came in the 1927-28 season when he was one of eleven different players tried out at inside-left. Four of his appearances came in the final five matches of this season with his single goal helping the side to a 5-0 home victory against Northwich Victoria in the First Round of the Cheshire Senior Cup. His league goal came in the 6-3 home win against Winsford United in September 1925. Before signing for Macclesfield in the summer of 1909 Ernest had played for Hazel Grove. Appearing in the same number of matches (32 in all competitions) in both his seasons at the Moss Rose, Ernest was first-choice centre-back only missing matches when injured. Reported to have always played with his usual coolness. In the 1910-11 season he gained a Manchester League Championship medal and a winners' medal in the Cheshire Senior Cup competition. He also represented Cheshire County in the match against Lancashire County in December 1909 and again in October 1910. A defensive midfielder with leadership qualities on and off the field. He was scouted from Ellesmere Port Sunday League team Beechwood Falcons under 13 level, and was recruited to the Macclesfield under 13 side in the former Centre of Excellence following a six-week trial. Progressed through the age groups and in the 2013-14 season was a second year apprentice and youth team captain. His first senior appearance came in the 2012-13 season from the substitutes' bench in the 75th minute of a round two Cheshire Senior Cup match which featured members of the youth team. Nathan made two further Cheshire Senior Cup appearances in the 2013-14 season. Having left Macclesfield signed for Congleton Town (summer 2104), then Droylsden (summer 2015) and returned to Congleton Town (December 2015). It would appear that he left Congleton Town at the end of the 2016-17 season. In May 2015 he spent time in South Africa teaching under-privileged children as part of his studies at Liverpool John Moores University. In the 1939-40 season Herbert played in Macclesfield's war-time team before joining His Majesty's forces. He signed for Halifax after the War and made 10 senior appearances for them in the 1946-47 season before moving to Stalybridge Celtic. He signed for Macclesfield on 4 September 1947 but only featured until early October 1947, his one goal coming in his penultimate match at South LIverpool. There is no information recorded for this player but as he only made a single appearance he was probably being given a trial. There is no information recorded about this player. Appeared in the opening match of the season probably on trial following successful appearance(s) in the pre-season matches. Given a trial in the first match of the 1885-86 season but was not signed at this time when he was up against stiff opposition in George Millington who was the regular first choice for the left-half position. Joey, a central defender, was recruited to the senior side for the 1892-93 season and played alongside Bolton and Burgess. With some match information missing for the 1893-94 season it is unknown whether Joey played throughout, but for 1894-95 and 1895-96 he was a regular first choice for the team, gaining a Cheshire Senior Cup winners' medal in 1896. It would appear that he then left the club, returning to play for Hallefield (Macclesfield FC having failed financially in 1897) for one season playing in the North Staffordshire and District League. He featured again in the re-formed Macclesfield FC Manchester and District League side for the 1900-01 season where in eight known appearances he scored eight goals, including four in the 8-0 home win against Prestwich on 29 December 1900. Colin commenced his career at Darley Dale before moving to the youth set ups at Leeds United (1995-98) and Manchester United (1998-2000). Given his first professional contract at United in 2000 he remained with them until 2006 but had loan spells at Royal Antwerp (2003-04), Cambridge United (2004-05) and Swindon Town (2005). Released by Manchester United in January 2006 he moved to Chesterfield where he remained until the end of the season. Signed for Macclesfield in the summer of 2006 Colin played wide right of midfield for most of the time, but showed his versatility when used as a striker which gave him the opportunity to score four goals. Although Colin was a hard working player, he rarely completed a match usually being substituted during the second half. He suffered a badly bruised leg which kept out of contention for the final two months of the season, and was released in the summer of 2007 signing for Farsley Celtic in September 2007 but quickly moved on to play for Knaresborough Town and continued his association with Knaresborough Town for the 2018-19 season where he was appointed assistant coach which he combines with his playing duties. There is no information recorded about this player who featured towards the end of the 1901-02 season. A member of the Macclesfield reserve team. Before joining Macclesfield played for Hurdsfield Rovers. 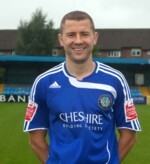 A regular in the Macclesfield senior team throughout his four seasons with the club usually playing on the left wing. He scored his fair share of goals including two hat-tricks and the only goal in the 1-0 win against Crewe Hornets in the final if the Cheshire Senior Cup in the 1890-91 season. Also held a Cheshire Senior Cup winners' medal for the 1893-94 season. Represented Cheshire at County level in October 1893 against Cumberland, a match which was played at the Moss Rose. Alan was signed from Cheshire League side New Mills having previously played for Ashton United, Altrincham, Witton Albion and Buscough. He soon found the back of the net, scoring in each of the three matches after his debut. He was then manager of the reserve team at Flixton and later served on the committee at Trafford. Signed as an amateur player, after his debut Dave did not feature again until the middle of March when he played in place of Keith Eccleshare until the end of the season. Appeared in the first football match under the new name of Macclesfield FC and from the limited amount of information available, Heathcote often appeared on the score sheet. In the 1877-78 season his goal secured a 3-2 win against Mount Pleasant in the first round of the Staffordshire Association Challenge Cup. In the next match he scored a hat-trick in the 5-0 win at Leek and the following season, against Leek again, he scored two goals in the 6-2 home victory. All his appearances came in the club's pre-league days. An amateur player whose single appearance came in the final league match of the season. Darren made 45 appearances for Burnley, his first club, before moving to Altrincham, Southport, Rhyl and Northwich Victoria. Despite his league experience, during his time at the Moss Rose he had to contend with strong competition, firstly from the experienced Paul Johnson and then Stuart Bimson. Darren gained a Cheshire Senior Cup winners' medal in 1991. On leaving the Moss Rose Darren played for Witton Albion (twice), Hyde United, Barrow, Altrincham (again), Winsford United, Trafford and finally Padgate St Oswalds. Tony was signed from league side Wycombe Wanderers in October 1995, having previously played under Sammy McIlroy at Northwich Victoria before a £25,000 transfer to Wycombe. He made his debut having been collected at Macclesfield station on the evening of the match, and was driven straight to Stalybridge. A very fast and tricky winger, Tony scored the winning goal for Macclesfield in the 1996 FA Trophy Final at Wembley. He was transferred to Hednesford in November 1996 for a fee of £12,000. Subsequently he played for Gloucester City, Altrincham, Winsford United, Chester City, Carlisle United, Ilkeston Town, Tamworth, Alfreton Town when he spent a month on loan at Halesowen Town, and Gresley Rovers. On retiring from football he moved into management initially as assistant manager at Gresley Rovers (2009-10) then as manager at Stapenhill (2010-11), Ashby Ivanhoe FC (2012-13) and Kimberley Miners Welfare (2015-16). Is a Learner Liaison Manager at Burton and South Derbyshire College. Paul’s only senior appearances came in the Cheshire and Staffordshire Senior Cup competitions. He was signed from Barnton to whom he returned when he left the Moss Rose. He then played for Witton Albion, Barnton (twice again), Nantwich Town and Middlewich Athletic. Charlie was on the books of Luton Town as a youngster but was released by them at the age of 15. He then played local football for Buntingford Town and Arlesey Town before signing for Wycombe Wanderers. He was released by Wycombe without making a senior appearance and moved to Grays Athletic, but shin splints meant that he did not appear for Grays either, and he signed for Haverhill Rovers in 2007 where he enjoyed good form which earned him a contract with Cambridge City where he became a fans' favourite with his penetrating runs, powerful shots and double somersault goal celebrations, making 31 league appearances and scoring six goals. He then signed for Dorchester Town for a fee of £7,500 but he only remained there for three months before moving to Havant & Waterlooville in November 2007 for an undisclosed fee. In his two seasons at the Avenue Stadium he made 37 league appearances and scored eight goals. His next club was Newport County where he again became a key player making 55 appearances and scoring 11 goals, his performances being noted by the manager of Luton Town where he initially signed on loan and then permanently in 2011. However, an injury sustained whilst he was a Newport proved more serious than first thought by Luton, and Charlie was sidelined for much of the 2011-12 season. He spent time at Aldershot Town to build up his match fitness during the 2011-12 season but could not force his way into the Luton side and was released in the summer of 2012. Along the way Charlie has earned caps at England C level. Charlie signed for Macclesfield Town during the summer of 2012 appearing regularly in early season matches when he scored his one goal, a penalty in the 2-0 home win against Dartford which he celebrated with his trade-mark double somersault. He displayed pace and enthusiasm on the right side of the midfield but lost his place to Jack Mackreth and fell back to the substitutes' bench. Opportunities were restricted as the season progressed when different formations were introduced which often reduced the numbers in the midfield, however, he returned to the starting line-up for a short spell in January 2013. Following a loan spell at AFC Telford United in February, his contract was cancelled by mutual agreement after which he signed for Whitehawk FC. He moved to Chelmsford City and then Team Wellington in the 2013-14 season, signing for Dunstable Town in the summer of 2014 and Chelmsford City in 2015. Macclesfield's reserve team 'keeper, Henton deputised for Richard Williams in the 4-1 home victory against Stockport County at a time when Richard was unavailable through injury. A Stockport junior, Herd joined Macclesfield taking over the centre-half role in November 1927 when seven different players had been used up to that time. He quickly established himself and made the position his own, only missing five matches during the remainder of the season. Derek joined Macclesfield from Colwyn Bay and during his time at the Moss Rose had a trial in the Irish League. Born in Dudley in the Midlands, George started his football career at Newcastle United in 1960 making 27 league appearances in two seasons. He signed for Everton in 1962 but only made 10 league appearances before moving to Manchester City in 1965 for a fee of £20,000 which was paid by monthly instalments of £1,000. Made almost 200 appearances in all competitions, and was an integral member of the team that won the Second Division title in 1965-66, Division One Champions, League Cup and European Cup Winners' Cup. On Christmas Eve 1971 he moved to South Africa for an eight month loan spell with Cape Town City returning to the UK in time to sign for Bury for the 1972-73 season making 37 league appearances. There is no record for the period between the summer of 1973 and when he signed for Macclesfield in 1977 but after only three appearances he moved to Northwich Victoria as their manager after which he was coach at Bury. On retiring from playing he became the landlord at various pubs including The City Gates Hotel on Hyde Road, a pub which had been central to Manchester City in their early days as Ardwick FC, and later the Carter's Arms in Wilmslow. After his life as a publican he became a social worker in the Blackpool area retiring in 2005. Died on 17 September 2006 at the age of 66 after a short illness. Started his career at Leeds United before moving to Wigan Athletic in December 1997, but did not make a senior appearance for either club. Sean then spent a short time at Huddersfield Town where he made 12 appearances. He moved to Kilmarnock in August 1998 and then to Blackpool in February 2004 and Chester City in the summer of 2004 making 92 appearances in all competitions. Sean spent the majority of the 2007-08 season on loan at Macclesfield as a central defender. A hard tackling player, he forged an excellent partnership with Ryan Cresswell on his arrival, to give the back-line a more solid presence. In the latter part of the season he was given the responsibility of captain. Sean signed a permanent contract in the summer of 2008 when he was also given the captain’s armband on a permanent basis. In his second season, he appeared regularly until he suffered a groin injury in February which resulted in a lay-off for most of the rest of the season and later underwent a hernia operation. He missed the start of his third season (2009-10) with a knee ligament damage injury picked up pre-season but returned in December. Ever-present thereafter, playing either at centre-back or, in Carl Tremarco’s absence, at left-back. Despite his solid and reliable performances Sean was released in the summer of 2010 when he signed for Accrington Stanley. Sean moved to Barrow in the summer of 2012, Prestatyn Town in the summer of 2013 and Marine in 2014. On manager Carl Macauley leaving Marine at the end of February 2015, holder of a UEFA B coaching license, Sean was appointed caretaker manager to the end of the 2014-15 season, and after ensuring Marine avoided relegation, was appointed manager in the summer of 2015. After a poor run of results Sean, together with his assistant manager, was dismissed on 22 February 2017. Elliott is a right-sided player who made his debut as an attacking right-back whilst still a member of the Youth team, becoming the youngest Macclesfield player to make a Football League appearance at the age of 16 years and 342 days. He signed his first professional contract, a two-year deal, in the summer of 2011 and appeared regularly in the senior side in the early stages of the 2011-12 season when he played with pace and determination. However, a groin problem, and the fact that he was also rested, meant that he missed matches in November and December 2011, and he was absent for the final two months of the season following a hip operation. Elliott has represented Wales at Under-19 and Under-21 levels, making his Under-21 debut as a second half substitute on 10 August 2011 against Hungary. Signed for Ipswich Town in May 2012 (14 league appearances) going on loan to Gillingham in January 2014 followed by two loan spells at Colchester United in 2014 and 2015. Signed for Notts County in the summer of 2015 where his contract was renewed in the summer of 2017. Prior to joining the Silkmen from Bolton Wanderers, Graham had gained a couple of England Youth caps and played for Everton, Manchester City, Horwich RMI and Blackpool. However, he was initially a reserve team player but was promoted to the senior side in the 1975-76 season when he scored on his debut in 4-2 victory against Wigan. He played with terrific enthusiasm and skill, being a stalwart midfielder in the troubled 1970’s. On leaving the Silkmen moved to Altrincham in the summer of 1978 for a fee of £1,200. He then emigrated to Australia during the UK 1978-79 season playing there for the following 10 years - Newcastle KB United (1979-1981), West Adelaide (1982-1983), Preston Makedonia (1984-1986) and Melbourne Knights (1987-1988). There are no records available for this player. Previously with Stockport County, he made two appearances for Macclesfield but was injured on his second outing. There are no records of him re-appearing for either the senior or the reserve teams. Prior to signing for Macclesfield was in Derby County's Central League side. He was given his chance from late October to early December but only managed to score one goal in the away defeat at Witton Albion. The signing of the free-scoring Billy Lomax put paid to any hopes of a regular place in the team. The regular right-back for Macclesfield's reserve team, featured occasionally in the senior side. There is no information recorded about this player who replaced Tommy Bullock, the regular centre forward, for this one Cheshire Senior Cup match. Signed from Chesterfield, he was a dependable full-back who returned to Derbyshire to play for Matlock after just one season. Tim was a member of the reserve side. Ken was a product of Merseyside soccer with Everton who joined the Silkmen from Cheshire League side Formby, having previously been at Ashton United and Burscough. He was a strong tackler and a commanding centre-back. Voted Player of the Year for the 1980-81 season. Moved to Burton Albion as part of an exchange deal for Nigel Long but must have only remained there for a short period as he signed for Southport shortly after. A member of the the Macclesfield reserve team who was given a taste of senior football in early season matches. Just one appearance for this player who was given a one match trial at a time when there was no regular player filling the left-back position. His introduction to the team was delayed due to injury and it may well be that as other players had established themselves, he only became a bit-part player during his two seasons at the Moss Rose. Played for South Wales Borderers and then Bolton Wanderers Central League team, Exeter City (May 1920) and Torquay United. At Macclesfield he was give a two match trial. Having missed three good goal scoring chances in his first match he eventually scored the third goal in the 3-1 win. His second match ended in a 0-0 draw, an unusual event in those days. Not signed after the trial. Before embarking on a football career Paul was a reporter on the Ashton News. He signed for Manchester City in 1966 making 7 league appearances and scored four goals, before moving to Charlton Athletic in 1968 (23 league appearances). His next stop was Bury in 1969 (38 league appearances) and then Crewe Alexandra in 1970 (48 league appearances) after which he signed for Macclesfield appearing regularly making 49 appearances out of a possible 65. On retiring from playing football he returned to journalism working for the Manchester Evening News as the Manchester City correspondent and later became the Chief Sportswriter and England correspondent. Paul retired from the Manchester Evening News in 2006 and later wrote a column for the internet based 'football.co.uk' and remains a prolific 'internet' journalist..
Having played for the reserve team earlier in the season was brought into the senior side for one match when the club had to fulfilled two matches in the Subsidiary Competition on the same day. A player with a long association with Macclesfield who featured in the forward line in Macclesfield's pre-league era. He was a regular member of the team who played their first league matches in The Combination in the 1890-91 season and this was the last season he was to play as a forward, dropping back to the defence from the 1891-92 season. Jack continued to appear regularly in the 1892-93 season, but after that he only made a small number of appearances during his last two seasons. Held Cheshire Senior Cup winners' medals for the 1889-90 season, the first occasion Macclesfield won the cup when he scored two of the four goals in the final, and the 1890-91 season. Given a one match trial. Steve was transferred from Bangor. An experienced midfielder who had also played for Runcorn, Stafford Rangers and Congleton Town having started his career at Reading. After Macclesfield he played for Witton Albion, Marine and South Liverpool. Steve was Sammy McIlroy’s first Football League signing in the summer of 1997, moving from Blackburn Rovers where he had been unable to break into the senior side. Playing at right-back and right wing-back, Steve was a strong defender, tackled well, distributed the ball intelligently and at the same time was an effective attacking player. Throughout his time with the Silkmen, Steve was dogged by a number of injuries, including being injured on his debut, but when fully fit was a valuable member of the side and won the Player of the Year award for the 1998-99 season. Also gained a Cheshire Senior Cup medal in 2000. Having been replaced by George Abbey, Steve moved to Welsh Premier League side Bangor City in January 2004 to join former Macclesfield manager Peter Davenport. Steve has since retired as a player, and has lived in France where he was the international scout for Tottenham Hotspur when he was instrumental in the signing of Luka Modric and then undertook a similar role with Liverpool where he played a big part in the signing of Luis Suarez. In August 2012 he was appointed Head of European Recruitment at Queens Park Rangers and in August 2016 Steve became one of two Directors of Recruitment at Derby County. In February 2017 he returned to Tottenham Hotspur as Head of Recruitment. Transferred to Macclesfield from Market Drayton on 2 January 1895. Hobson's only match for Macclesfield came when he featured in the Semi-final of the Cheshire Senior Cup in March 1895 against the Chester Police in which he scored the opening goal in the 3-2 victory. Fred commenced playing football with boys teams. He joined the army in 1915 during the Great War where he served for four years winning a Distinguished Conduct Medal. During the war he played a few matches for Grimsby Town and on demobilisation in 1919 was on the books of Tranmere Rovers. In the 1922-23 season he played for Ashton National before signing for Macclesfield in the summer of 1923. He moved to Altrincham for the 1924-25 season. A 16-year-old Manchester Grammar schoolboy who showed promise. When he played for Macclesfield he had already made four appearances for the West Bromwich Albion reserve team. Other than his debut, all his appearances came in the months of December and January. Started his career in the youth section at Margate before signing for Manchester City (1963-64) where he made one senior appearance. He then moved to Stockport County (1964-66) where he made 46 league appearances scoring nine goals before a short spell at Bangor City in 1966. Signed for Macclesfield Town in September 1966. A member of the youth system at West Bromwich Albion he progressed to the senior ranks during the 2005-06 season and spent time on loan at Aberdeen (2008-09) and then Northampton Town (2009). Released by the Baggies in the summer of 2009. To maintain match fitness played for Market Drayton Town at the beginning of the 2009-10 season but signed for Conference Premier League side Forest Green Rovers in October 2009, remaining with them for five years making 182 appearances and scoring six goals. In the summer of 2014 he joined Kidderminster Harriers making 75 appearances but was hit by injuries and having recovered spent time on loan at Torquay United for two months from January 2017. On leaving Kidderminster Harriers Jared signed a two-year contract with Macclesfield Town in the summer of 2017. Appointed captain, Jared incurred a groin injury pre-season which prevented him from making his debut for the Silkmen until 23 September. He also missed six other matches through injury but otherwise he made the right full back position his own. Part of a solid back line he made a useful contribution to the team who were champions of the Vanarama National League for the 2017-18 season. His single goal came in the 2-0 victory at Barrow in November2017. From Chorley, Hodgson was describe as a small but effective, tricky player who was an accurate passer of the ball. He scored on his debut in the 1-2 defeat at Oswestry but it would appear that he could not establish himself in either team, playing his last match for the club in the middle of December 1911. Formerly of Holyhead, brought in for a one match trial in the 1-7 defeat. Brian was a strong and resolute amateur player who had previously played for the British Legion. Commenced his career in the youth section of Woodley Sports (now known as Stockport Sports) in 2007 remaining there for three years. Signed for Halifax in July 2010 making 132 appearances in all competitions over three years before signing for Fleetwood Town in May 2013 on a free transfer. Joined Macclesfield Town on loan in November 2014 featuring regularly in the side as a useful centre back. Unfortunately sustained a broken bone in his foot during the match against Grimsby on Boxing Day resulting in him returning to his home club, Fleetwood Town, just before his loan spell was due to end. Signed for Tranmere Rovers in the summer of 2015 and moved to Gateshead in the summer of 2016. Signed a three year deal with Salford City in the summer of 2017. Played in the early days of Macclesfield FC and represented Cheshire County in November 1878. Graham Phythian. in his book Saga of the Silkmen. writes 'Alfred Holcroft bore the nickname 'Pin John' after his ingenious innovation in the silk mill managed by his father. Noticing the wastage involved in the strips of silk dropped on the floor and subsequently disposed of, he advocated the pinning of these pieces to a board, to be used in later work. He was also a useful runner, having won the 440 yards on the same day as Peter Bond's near-monopoly of the distance events at the Volunteers' Athletics Festival'. An amateur, Peter was a fringe player in the senior side whose debut came about when four first team members were out of contention. His only league appearance came in the 0-2 defeat at Great Harwood. A member of Swindon Town Youth section he progressed to the senior ranks in 2004 but spent much of his time out on loan at Basingstoke (2005), Salisbury City (2006) and Newport County (2006-07). Ashan spent the second half of the 2006-07 season on loan from Swindon Town, only being used in the centre of midfield when Alan Navarro was unavailable through injury. Although he never played a full match, he put in some lively performances and scored his first senior goal at Boston in April 2007. Since leaving the Silkmen Ashan was released by Swindon and has played for a number of clubs – Weston-super-Mare (2006), Eastleigh (2007-08), Cirencester (on loan in 2008), returned to Weston-super-Mare ( 2008-09), Newport County (2009-10), Swindon Supermarine (2010-11), Maidenhead United (2011-12), Oxford City (2012-13), Chippenham Town (December 2015), Poole Town (February 2016) and Slough Town (January 2017). Having suffered some serious injuries along the way Ashan retired from playing and set up Global Soccer ID in Swindon which is a multifunctional football company created to help footballers around the world who may have been released, ill advised, injured or just simply unlucky, offering them the chance to show their abilities and enhance their player profiles. From 1897-98 to 1901-02 was the first choice inside-right scoring his fair share of goals. He was a member of the Hallefield Championship side in the Stockport and District League in 1897-98 who were undefeated throughout the season. (Hallefield had moved to the Moss Rose Macclesfield FC having failed financially in 1897). Also a member of the Hallefield North Staffordshire and District League team for the 1898-99 and 1899-90 seasons and the re-formed Macclesfield FC's Manchester and District League side in 1900-01. By 1902-03 other players had been signed and he found himself as a bit-part player. His sole senior appearances came in the 1-1 draw at Rhyl. He was described as a British Legion goal-scoring forward. George was an amateur who was signed from Northern Nomads. He played on three occasions during a season when several different players were used in the outside-left position. A member of Macclesfield's reserve side, he made two appearances in October 1935 in place of the regular inside-right Frank Eaton. Joined Macclesfield from Leek. An excellent wing-man who could score goals including a hat-trick in the second qualifying round of the FA Cup in November 1893 against Chester. There is no information recorded about this player but as he only made one appearance he was probably on trial. A member of the reserve team who played in two late season league matches when players were being rested between the Challenge Cup semi-final and final ties. Initially with the youth set up at Morecambe (2013-2014) where he was also given an opportunity in their reserve team. With Stockport County Development Squad from the start of the 2014-15 season but featured for Northwich Flixton Villa and Northwich Victoria in March 2015. Signed non-contract forms with Macclesfield in August 2015 but could not force his way into contention making a single substitute appearance in the FA Trophy and one in the Cheshire Senior Cup. Signed for Droylsden in November 2015 moving to New Mills in January 2016 and then signed for Congleton Town in the summer of 2017 but is also registered to play for Egerton FC. Moved to the United States of America signing for Memphis 901 as a free agent on 5 March 2019. Chris started his career in the youth section of Crewe Alexandra, completing the third year of his scholarship at Chester City where he signed as a professional in 2006: in two years he made 51 appearances scoring five goals. In 2008 he signed for Cambridge United where he played regularly scoring 26 goals in 67 appearances, after which he signed for Brighton & Hove Albion in 2008 for an undisclosed fee. Whilst there he slipped down the pecking order and spent time on loan at Stevenage and Bury before signing for Rotherham United in 2011. Only scoring a single goal in 19 appearances, Chris moved to Preston North End in January 2012 for an undisclosed fee and again found it difficult to score goals only netting once in 20 appearances. Chris, born in Macclesfield, signed a six-month loan deal with the Silkmen in August 2012. Following his debut he regularly played in the forward line alongside Matthew Barnes-Homer scoring the only hat-trick of the 2012-13 season in the 4-3 away win at Stockport County in September 2012. Returned to Preston North End at the beginning of January 2013 when he was released by them, later signing for Morecambe. Having been released by Morecambe at the end of the 2012-13 season Chris signed for Macclesfield Town. Although featuring in 45 of the 57 matches played, Chris made many appearances from the substitutes' bench and there were times when he was substituted even when he made the starting line-up, resulting in him only playing for the full 90 minutes in 16 matches. To place his appearances in context it has to be taken into account that Chris faced strong competition from prolific scorer Connor Jennings and season top-scorer Scott Boden. Chris missed a few early season matches with a hamstring strain and late season matches with a groin strain. He scored some important goals including the only goal in the 1-1 early season draw at eventual champions Luton Town, and the winning goals in the 2-1 home victory against Welling and the 3-2 home victory against Chester. During the 2014-15 season Chris featured in the majority of matches, starting off the season in his usual striker role but then filled the right wing position for the majority of the season. In the second round of the Cheshire Senior Cup competition on 24 February 2015 against Crewe Alexandra at the Moss Rose, Chris made his 100th appearance in all competitions for the Silkmen. The 2015-16 season saw Chris continue as the first choice on the right wing where he worked with plenty of energy missing only a handful of matches. For the 2016-17 season Chris reverted to his role as a striker completing the season as the top scorer with 14 goals, all but one of his goals were scored in the Vanarama National League matches. Usually operating as the sole striker in a 4-1-4-1 formation, Chris always played with energy and enthusiasm making his 200th appearance for Macclesfield in the home match against Gateshead on 14 March 2017. Voted Players' Player of the Year. Out of contract with Macclesfield, Chris elected to sign for fellow Vanarama National League side Wrexham in the summer of 2017. Started his career at Blackburn Rovers (1995-96) signing for Preston North End in 1996. The left-footed striker spent a month on loan at the Moss Rose in the 1998-99 season with his only goal coming on his debut in the home win against Reading. Michael’s loan was not extended at a time when Preston were looking for a permanent move for a fee of £25,000. He went on loan to Rochdale for whom he signed in January 1999. During his time at Rochdale he spent a month on loan at Northwich Victoria leaving Rochdale in May 2000. He then sent five years in Ireland with Football League of Ireland sides St Patrick's Athletic (2000-03), Derry City (2003-04), St Patrick’s Athletic (2004-05) and Dublin City (2005). He returned to England in 2005 to join the Lancashire Police Force and signed for Nelson helping them to win promotion to the North West Counties Football League Division One in the 2005-06 season when he scored 36 goals. He joined his home team Barnoldswick in 2006 helping them to gain promotion and on leaving them (date unknown) signed for Padiham after which he retired from playing football to concentrate on his Police career. At this time he was undertaking some coaching and occasionally turned out for the Police side. Started out playing for Manchester YMCA and then Cheadle Lads in the Stockport Combination. Then moved to Arsenal Reserves, Manchester City Reserves, Altrincham in 1927 and Ashton National in the summer of 1929. Moved to Macclesfield in November 1929. In his career he had played in every position other than goalkeeper and at Macclesfield he continued to demonstrate his flexibility occupying more than one of the defensive positions. In 1930 he gained a Cheshire Senior Cup winners' medal. On leaving Macclesfield spent a period of time in the USA. On his return he was signed by Cardiff City in the summer of 1931, Berne in May 1932 and Rossendale United in August 1932. With Macclesfield for the whole of the 1896-97 season scoring two goals on his debut in the 7-0 win whilst playing in the forward line. However, from November 1896 to January 1897 he filled the right half position. Only featured in the first two matches of the 1897-98 season for Hallefield, who had moved to the Moss Rose when Macclesfield FC had failed financially in 1897, nevertheless, back in the forward line, he scored two goals in the first match of the season in the 4-1 home win against Stockport All Saints. Brother of William who was given a one-match trial and was said to be an inexperienced player. Whilst playing for his school, the team won the the Flintshire Championship when he scored 65 goals in 16 matches. At this time he won a schoolboy Welsh international cap. Still at school, he signed for Chester (March 1929) making his debut at the age of 14. He moved to Halifax (August 1930) at the age of 18. Signed for Macclesfield at the age of 20 in the summer of 1932. Throughout his one season at the Moss Rose he only missed one match through injury, his goals and skill helping the Silkmen to win the Cheshire League Championship. His goals were evenly spread through the season and he scored a hat-trick in the 5-2 home win against Witton Albion in December 1932. On leaving Moss Rose he signed for Ramsgate (summer 1933) and then Flint Town United (November 1934), Mold Alexandra (January 1938) and returned to Flint Town United (1939-40). By trade he was a mechanic. Tony was a former Manchester United apprentice who had played for Runcorn and for a short time at Mossley. Prior to signing non-contract forms with Macclesfield it is said that he had not been taking his football career seriously but had made an impression in the Manchester Sunday League, but after just one match at the Moss Rose, he was given a trial at West Bromich Albion. His first goal came in the 4-2 defeat at Farnborough and his second in the penultimate match of the season, in the victory at the Moss Rose against Gateshead. A player with Ward Street Old Boys, Stockport, brought into the side for four consecutive matches towards the end of the season. He was one of 22 players who made less than five appearances in a season when a total of 48 players were used. Joined Notts County on schoolboy forms in 1991 and then spent two years on their YTS programme during which time he won their 'YTS' Player of the Year award, after which he was awarded his first professional contract for a single season. Whilst at Notts County Brian spent a short time on loan at Macclesfield but only featured on one occasion in the Staffordshire Senior Cup. On leaving Notts County he signed for Ilkeston late in the 1993-94 season and played for Greasley Rovers from 1995 to 1998 and signed for Boston United in 1999. Brian also lists the following clubs as ones he has been on the books of - Mansfield Town, Hartlepool United, Scarborough, Bradford City, Worksop Town, Hinckley United and Matlock Town. Having retired from playing Brian is now (2018) employed as a manager at Future Products Limited and a football scout. Started his career in the youth team at Walsall before signing for Non-League side Hednesford Town (his home town). Moved back into the Football League when he signed for Port Vale in 1970, the transfer fee reportedly being 'a pint of shandy', as the Vale were cash strapped at the time. He then moved to Brighton & Hove Albion (1976-81), Luton Town (1981-84) and then Hull City as player/manager (1984-88). He made over 200 Football League appearances at both Port Vale and Brighton scoring over 30 goals at each club from the midfield. Horton was appointed manager at Macclesfield Town on 1 April 2004 taking over from John Askey with the team in 23rd position in the Nationwide League Division Three and threatened with relegation. In the remaining seven matches the team won four, drew one and lost two which was sufficient to complete the season in 20th position with 52 points. The 2004-05 season was Horton's most successful at the Moss Rose partly due to striker Jon Parkin, who had been recruited to the club by John Askey, scoring 26 goals in all competitions. The team spent most of the season in a top-five position, completing the season in fifth position with 75 points qualifying for the Nationwide League Division three Play-offs, but their promotion challenge was ended by Lincoln City in the semi-final. Horton celebrated his 1000th game as a manger on 2 November 2004 when Macclesfield were 4-0 winners at the Moss Rose against Mansfield Town in Second Round of the LDV Vans Trophy and he was League Two Manager of the Month in February 2005. During 2005-06 the team could not emulate their progress in the previous season but there were problems in the background. Horton's assistant, John Askey, was given six months notice, the FA served a fine on the club and ordered a partial repayment of a grant from the Football Foundation placing the finances of the club in some difficulty. Striker Jon Parkin was injured in a pre-season friendly match, only returning for the last match in October and was sold to Hull City in January 2006. In the first half of the season the team languished near the bottom of the league but after 5-4 win at Wycombe Wanderers on 2 January 2006 their form improved slightly, completing the season in 17th position. However, Horton guided his team to the Northern Area Final of the LDV Vans Trophy narrowly defeated on the 'away goals' rule by Carlisle United. There was an inauspicious start to the 2006-07 season with Horton unable to motivate his team losing eight and drawing four of the first 12 matches leaving the team in 24th position resulting in Horton being dismissed. In May 2007 Horton returned to Hull City as assistant to Phil Brown, but in the 2009-10 season Brown was placed on gardening leave with Horton and Steve Parkin appointed caretaker managers. They were relieved of their positions before the end of the season when Ian Dowie was appointed manager. In January 2011, on the appointment of Phil Brown as manager of Preston North End, Horton was appointed his assistant but left Preston in December 2011 when Brown was sacked. Horton returned to Macclesfield Town in the middle of March 2012 charged with keeping the club in the Football League. Horton had succeeded in saving the team from relegation on the last occasion he was manager at the Moss Rose, but on this occasion he did not have players of the same quality and the team could only pick up two points in the eight matches under Horton's guidance. As a result Macclesfield were relegated to the Conference in 24th position with a match to play, at which stage Horton left. In June 2013 he was appointed assistant manager to Paul Dickov at Doncaster Rovers, leaving the role in July 2015. Joined Phil Brown yet again in August 2015 as football co-ordinator at Southend United leaving in January 2018 when manager Phil Brown was dismissed. A local player from Bollington, he was given a one match trial when Macclesfield lost 0-8 in front of a crowd of 10,000 at Wigan. Believed to be a member of the Bollington Cross team. A member of the Macclesfield reserve team brought into the senior side when the first choice right-back was unavailable to play, including the home match against Witton Albion at the end of March 1908 when the regular right-back, W Yates, was serving a seven day ban. In the First World War he joined the services in January 1915 with the Royal Engineers for whom he represented at football. He was posted overseas for four years serving in France, Serbia and Constantinople. On demobilisation in 1919 he played for St Ninian's Thistle and then King's Park. He won a Junior International cap in 1921 when he represented Scotland against Northern Ireland, two weeks after signing for Crewe Alexandra in 1921 where he played in their Cheshire League side. An attacker of ability and resourcefulness, Jock signed for Macclesfield in the summer of 1922 and went straight into the team appearing regularly on the score sheet including a hat-trick in the 6-3 away win at Altrincham on 14 October 1922. He was badly injured in the following match against Tranmere Rovers and did not return to play until 3 February 1923 when he was yet again on the score sheet, but by then James Morris had established himself as the first choice Inside-right. A few more opportunities came his way but at outside-right, and he left Macclesfield at the end of the season signing for Wrexham. In the summer of 1924 he moved to Nantwich but signed for Llandudno in October 1924, then Crewe Alexandra (October 1925), Runcorn, Llandudno for a second time (March 1937), Witton Albion and Stafford Rangers (summer of 1928). He was a joiner by trade. Signed for Macclesfield from Buxton in the summer of 1907 going straight into the team and was almost ever-present throughout the season missing just two matches. He was top scorer by far with a total of 23 goals including four in his second appearance in the 7-1 win at Newton Heath. He was also the team's penalty taker successfully converting five spot kicks. A member of the reserve team who played in a single match in place of the injured Jack Prescott. In his early teens played for the 8th Cheshire Rifle Volunteers. With Macclesfield he played in different forward positions and is a player who John Earles held in high esteem - 'One of the earliest and best forwards ever possessed by Macclesfield, and was always in the thick of the fight. He was a good runner and played a strong game - he could also play a rough game if needed.' However, from the information available, other than in the mid 1880's he does not appear to have featured regularly as a first choice forward during his long career with Macclesfield. Known as 'Mush', he held a winners' medal for the Cheshire Senior Cup in 1889-90, the first time Macclesfield won the cup and he was awarded a benefit match against Stoke. Also represented Cheshire at County level. When he retired from playing he was the club's trainer for two years. By trade he was a silk worker and his hobbies were canary breeding and poultry. Neil started his career at Burnley where he made one appearance, and first joined the Silkmen on loan from Turf Moor during the 1993-94 season, signing permanently the following season. He was a stalwart of the Macclesfield defence in the Conference and enjoyed success gaining England semi-pro honours, winning a FA Trophy medal in 1996, a member of the Conference championship sides in both 1995 and 1997, voted into the Conference team of the year on two occasions, was team captain and voted Player of the Year for the 1994-95 season. He also gained winners' medals in the Conference League Cup in 1994 and the Staffordshire Senior Cup in 1994 and 1997. A member of the Nationwide League Division 3 side in 1997-98 which completed their first season as runners-up, gaining promotion to Nationwide League Division 2. Also in this season Neil also gained a winners' medal in the Cheshire Senior Cup. Unfortunately his time in the Football League with the Silkmen was not as fulfilling as he was asked to play in the unfamiliar role of left-back because of new signings, nevertheless he continued to defend well and got forward on a regular basis to score the occasional goal. In the 1998-99 season he spent much of his time on the bench and became despondent resulting in a transfer to Cheltenham Town in February 1999. Neil subsequently moved to Telford United and then Kidderminster Harriers where he was the assistant manager. He was then first team coach at Cheltenham Town until the summer of 2014 when he left of his own volition at the end of his contract. Appointed Head of Operation and Player Analysis at Bury in 2014 and moved to Portsmouth in 2016 as Head of Recruitment. More recently has been Head of Recruitment at Salford City. Rejoined Macclesfield Town in June 2018 as joint assistant manager, with Danny Whitaker, linking up again with newly appointed manager Mark Yates with whom he was assistant manager at Kidderminster Harriers and Cheltenham Town. On the dismissal of Mark Yates as manager in October 2018, appointed joint caretaker manager along with Danny Whitaker. With the appointment of a new manager imminent, Neil was dismissed by the club just before the home match against Yeovil Town on 24 November 2018. Bobby’s football career commenced at Huddersfield Town in 1966 where he went on to make 144 appearances scoring 18 goals. He then moved to Blackburn Rovers (1975-76), Halifax Town (1976-77), York City (1977-78) and Rochdale (1978-81) before signing for the Silkmen. On retiring from playing football it is reported that he became a folk singer on the Yorkshire Club circuit. All three of his appearances came at the end of the season when the team were completing a backlog of fixtures. He enjoyed mixed fortunes with one win, one draw and one defeat. On leaving Macclesfield signed for Winsford United in the summer of 1927. Described as a 'newcomer' in the press whose performances were reported as satisfactory and should prove to be a player who could be relied on. Nevertheless he was not accepted by the committee who gave trials to numerous players during the 1919-20 season. Played at inside-right for the reserve team during the 1910-11 season making his two senior appearances in early season matches. First played for Clayton United in the Manchester District before moving to Openshaw in the Manchester Amateur League where he won a Championship medal and winners' medal in the Amateur Cup. Then signed for Stockport County as an amateur assisting them during World War One. Signed for Macclesfield in the summer of 1920, remaining for two seasons with his appearances divided between inside-left and outside-left. In his first season he played in the majority of matches but in the 1921-22 season only appeared occasionally after the middle of November 1921. David was a hard working winger who was signed from Stoke. He scored on his debut in the 1-0 away win at Northwich, and also scored in his next two matches, in the 2-1 defeat at Gainsborough Trinity and the 2-2 draw at Buxton. However, he only remained at the Moss Rose until October 1974 when he moved to Leek Town for a fee of £100. There in no recorded information available for this player. From Staffordshire, he was brought in for end of season matches at a time when the side were completing a backlog of matches. A young player from Chester who played in two matches in March and April at a time when different players were filling the outside-left position. An amateur player who had been playing in the Newcastle League prior to signing for Macclesfield. Ken replaced Charlie Birmingham and enjoyed a splendid debut scoring two goals in the 3-0 home win. He continued to score regularly in his short time as the team's centre forward until he lost his place to the free-scoring Billy Lomax. A local lad who was given a one match trial a week after Bithell had made his debut, however, Bithell was preferred for the inside-left position. An eighteen-year-old from Manchester who had been playing at junior level. He featured regularly after his debut , including nine consecutive matches, until the end of January 1926 after which he only appeared when deputising for senior players. He was quickly on the score sheet scoring two goals on his debut in the 4-1 win, and also scored two goals in the 3-1 home win against Whitchurch early in January 1926. One of numerous players during the 1919-20 season given a one match trial. This player first appeared for Macclesfield in their Combination side in 1896-97 playing at centre forward. For the first four matches of the 1896-97 season three different players had filled the centre-forward position. It would appear that Hulme was signed to fill this position as, following his debut, he was ever-present for the remainder of the season. He left Macclesfield FC when the club encountered financial problems at the end of the 1896-97 season. He then played for Lincoln City (June 1897), Gravesend United (May 1898), Wellingborough Town (April 1899), Bristol Rovers (April 1901) and Brighton & Hove Albion (August 1902) where he made 159 league appearances and scored six goals. On leaving Brighton he returned to live in his native Leek and re-signed for Macclesfield in September 1908 and, although towards the end of his Football League career he played as a full back, on his return to Macclesfield he was reported as a speedy winger and a good crosser of the ball, Hulme went straight into the senior side scoring on his debut in the 3-2 away win at Northwich. He was ever-present in the team's Manchester League Championship season in 1908-09 until the final two matches which he missed through illness. It is reported that he became the trainer for Leek United, an appointment which he possibly took up for the 1909-10 season as he only made two appearances for Macclesfield that season, the first in the FA Cup in September 1909 and the second in a league match at the end of February 1910 against Newton Heath when he scored the penultimate goal in the 6-0 home win which was his final match for Macclesfield. Enlisted in the Royal Sussex Regiment at the start of the First World War, he was serving as a corporal in the 7th Battalion when he lost his life in action on 3 October 1916 at the age of 38 at Gueudecourt in the Somme department of France. He is commemorated on the Thiepval Memorial (second photograph) and on the Nicholson War Memorial in Leek (third photograph). The bottom photograph shows his entry 'A Hulme' on the Nicholson War Memorial. Kevin was signed at Christmas 1995, bringing a wealth of league experience to the side. He played at Bury for six seasons where he was involved in four play-offs. He moved from Bury for a fee of £45,000 to Doncaster and later returned to Bury for the same fee. He had a short spell at Lincoln before signing for Macclesfield on a free transfer. He won a FA Trophy winners’ medal in May 1996, playing his part when he came on from the substitutes’ bench for Steve Wood. Spent time at Halifax in the 1996-97 season, and it was his goal in the 3-3 draw in the Silkmen’s penultimate match which meant they had to wait until the final match of the season to claim the Conference Championship and promotion to the Football League. He joined York City in September 1999 but had to retire due to a knee injury. In 2014 was working with his uncle running a roofing business in Bury. There is no information recorded for this player. In a season where there is missing data it is unknown whether Hulse made any appearances other than in the first round of the Cheshire Senior Cup on 19 January 1901. Before signing for Macclesfield had played for Lancaster and Sandbach Ramblers. Played fairly regularly, initially at centre-forward and then at inside-left, and could consider himself unfortunate not to be selected for the final of the Cheshire League Challenge Cup. With the regular goalkeeper Jack Hacking sidelined, Humphries was signed on a month's trial but only appeared in the first three matches of the season, all played over a period of seven days, when he conceded six goals. Joined the Silkmen from local youth football as a 17-year-old, his appearances coming late in the season. Featured in the 1904-05 season from the start until the middle of January when Smith returned to keep goal. Moved to Stretford in February 1905, but returned to make one appearance in the 1905-06 season deputising for John Wilkinson who was unable to play due to business commitments. Note: In reports his name was variously spelt 'Humphries' and 'Humphreys'. Having played in the Lancashire Combination, he was one of many players given a trial in Macclesfield's first season after the Second World War. Despite scoring in his one appearance he did not feature again. Jack is a local lad who attended Tytherington High School and signed for Stoke City at the age of 12 where he remained until he was 16. He played a few games for their under 18 side and captained Cheshire under 16 side during the 2012-13 season. For some unknown reason Jack was not offered an apprenticeship at Stoke and after a successful trial joined Macclesfield Town. He became a member of the Silkmen's under 16 Development Squad at the end of the 2012-13 season becoming an apprentice at the Moss Rose for the 2013-14 season and was awarded his first professional contract in the summer of 2014. Jack is a speedy midfielder with an eye for goal, and set up Tomi Adeloye's first goal with an excellent pass on his debut in the Cheshire Senior Cup at FC Hyde in January 2015. He went on to score the winning (and only) goal in the semi-final of the competition against Stockport County and also played in the final gaining a winners' medal. Left Macclesfield at the end of the 2014-15 season having completed the second year of his scholarship. Jack had a short spell at Marine from February 2016 to the end of the 2015-16 season, and then played for Cheshire League side AFC Macclesfield during the 2016-17 and 2017-18 seasons as well as representing the Edgehill University football team. Signed for Congleton Town in January 2019. A local amateur player who only featured in a handful of matches and later signed for Congleton Town. There is no information know about this player who featured in the first match played under the name of Macclesfield FC. Another player who was probably on trial with all his appearances coming over a period of a month. He was asked to play in three different forward positions and scored his two goals in the 5-1 home win against Hazel Grove at the beginning of January 1912. A former Aston Villa trainee, Michael gained his first professional contract with Southend United in the summer of 2003. He moved to Walsall in September 2005 and quickly to Port Vale in October 2005 where he spent much of his second season on the substitutes’ bench. In four years Michael only made a total of 77 senior appearance in all competitions, and having been released by Port Vale he signed a two-year contract with the Silkmen as Ian Brightwell’s first signing. Troubled by injury he only made a handful of appearances, but spent a month on loan at Telford AFC. His contract was cancelled by mutual agreement at the end of January 2008 after which he signed for Oxford United but was released during the 2008-09 season. On leaving Oxford he joined the Royal Marines and played several matches for them. In December 2012 he signed for Redditch United. He has also spent time coaching the West Brom fans team, Boing FC. Having left the Royal Marines in 2013 he took advantage of the services offered by Rail Safety Solutions who provide help to former members of the Armed Services to make the transition to the Rail industry. Michael was first appointed as works manager at the Crewe High Output Depot and has progressed to be employed by Network Rail as a Senior Campaign Manager. Colin started his career with Crook Hall and then Consett Iron FC before signing for Stoke City, initially as an amateur. During his National Service with the RAF he broke a leg and never recaptured his true form. After making nine first team appearances as a forward in six years he joined Stafford Rangers in 1958 following a loan spell with Crewe Alexandra. He then moved to Macclesfield where he was described as a scheming and hard-working inside forward who always threatened danger and scored many goals. He was a member of the team which did the double in 1963-64 winning the Cheshire League and the Cheshire Senior Cup. Later, at the age of 30, he became one of the youngest ever player-managers at Stafford Rangers, was appointment manager at Nantwich in 1973 and Droylsden in December 1979. Outside football he ran a stationery business in Newcastle-under-Lyme. Simon started his football career at The FA School of Excellence at Lilleshall in 1984. After two years at the school he was signed up by Manchester United, where he spent one year as an apprentice, and two as a professional between 1986 and 1989. Martin O’Neill signed him for Wycombe Wanderers in 1990, initially as a non-contract player. At the Moss Rose Simon was used as a squad player with many of his appearances coming from the substitutes’ bench. Following his release from Macclesfield, he underwent a double hernia operation and having recovered moved to Northwich Victoria early in the 1996-97 season. Simon played for England at Schoolboy and Youth level and collected a FA Trophy Winners’ medal twice. Lives and works in his native Sheffield. Stuart started his career with Sheffield Wednesday but was signed by Macclesfield from Buxton. He was a consistent marksman scoring two goals in a match twice: firstly in the 3-0 victory in the First Qualifying Round of the FA Cup against Congleton, and secondly in the 5-0 away win against Droylsden in the North West Floodlight League. He broke an ankle in March 1975 from which he had not recovered from at the beginning of the following season, effectively ending his time at the Moss Rose. Having recovered from his injury he went on to play for Stafford Rangers. An assumption has been made here that Hyde, playing at left-half, first featured for the Silkmen in the 1914-15 season. He replaced Lomas in January 1915 after which he was virtually ever-present to the end of the season. His one goal came in the 4-0 home win against Chorley in January 1915. Signed from Congleton during the 1927-28 season, Hyde played in five consecutive matches at left-half in a season when there were continual personnel and positional changes. During a barren spell for the Silkmen, a further experiment was carried out in the home match against Runcorn on 21 January 1928 when four new players were introduced and Hyde moved to the outside-left position. The team lost that match and again when he appeared at outside-left two matches later which was his last appearance for the Silkmen.